ADAM, Vauxhall’s stylish urban-chic newcomer, is poised to take the fashion-led A-sector by storm when it arrives in the UK early next year. With over a million different specification and trim combinations, ADAM introduces unprecedented levels of personalisation into this style conscious segment, giving every customer the chance to create a truly bespoke ADAM reflecting their individual style and personality. The all-new funky three-door hatchback measures 3.70 metres in length and 1.72 metres in width, seats four people comfortably, and is Vauxhall’s first entrant into a segment which has grown by 30 per cent since 2000. ADAM continues Vauxhall’s rapid product offensive which will see four incremental segment introductions in just 18 months (Ampera, Mokka, ADAM and upcoming Cascada). Keenly positioned within the segment, prices range from £11,255 (ADAM JAM 1.2-litre 70PS) up to £14,000 (ADAM SLAM 1.4-litre 100PS). Personalisation begins with the selection of one of three trim levels – ADAM JAM (fashionable/colourful) – ADAM GLAM (elegant/sophisticated) and ADAM SLAM (racy/sporty). The next level of customisation comes with the addition of option packs, and from here the possibilities are virtually endless, with the choice of 12 body colours, 15 seat designs, 20 alloy wheel styles, three printed headliners and no less than 18 interior décor panels, to mention just a few. Ground breaking customisation is matched with forward thinking technology introductions. Exclusive to ADAM, IntelliLink, the new on-board infotainment system, integrates the owner’s smartphone (Android and Apple iOS) with the car, making internet based applications available on the facia mounted touch screen. Other features include a new-generation Park Assist that automatically parks the car, a Side Blind Spot Alert and a power steering system including a ‘light touch’ CITY mode. ADAM will not only reach out to loyal Vauxhall customers, it will also attract those who had not previously considered the brand with more than half of the predicted sales coming from new customers. Typically for a car of this type the majority of sales (80 per cent) will be to private buyers, however thanks to its unique tailoring potential it is also expected to become a statement vehicle in the business car arena for companies wishing to strengthen their brand. ADAM arrives at a key point in Vauxhall’s product offensive. Since 2008, Vauxhall has completely reshaped its model line-up, starting with the flagship Insignia, continuing with its major volume models, and now entering new segments with the Ampera (extended range electric car), the Mokka (small SUV), and the upcoming Cascada (full-size convertible). Unlike other rivals in the segment, the ADAM bucks the trend and moves away from retro-based design opting instead for a fresh striking execution with a clear focus on innovation, personalisation and quality. 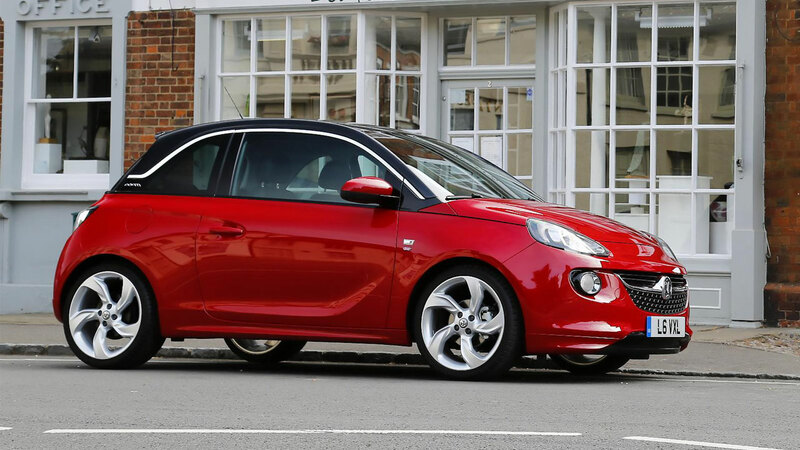 Everything about the ADAM’s design is deliberate, reflecting individuality and premium quality. For example the eye-catching ‘floating’ roof is visually disconnected from the body; not only is this a stunning design feature it also allows the perfect execution of two-tone colour combinations, a key focus for exterior customisation. Moving to the name badge, normally you would find this on the rear of the car but with ADAM it is positioned at the end of the chrome ‘signature’ window moulding on the rear pillar adding to its unique appeal. State of the art LED lights are also found at both the front and rear – a first in the fashion-led A-sector adding to ADAM’s premium feel. 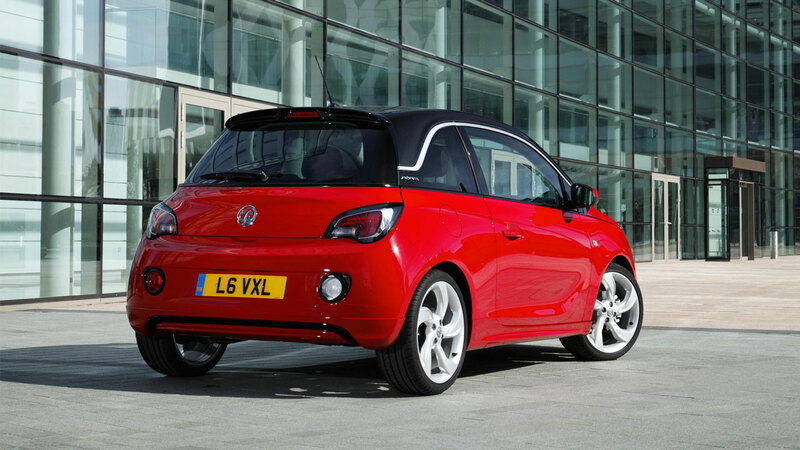 Undoubtedly fresh and new, ADAM clearly retains Vauxhall’s award winning sculptural design DNA. The blade featured in the lower door and the crisp ‘shock wave’ around the handles is reminiscent of the Astra GTC; the wing-shaped chrome grille bar reflects New Astra and the headlamps featuring wing-shaped daytime running lights are also typical Vauxhall design features. Inside the cabin the premium feel continues to deliver on ADAM’s upmarket exterior promise. Sculptured harmonious surfaces and graceful flowing lines, synonymous with ADAM’s bigger brothers the Insignia, Meriva and Astra, complement the all new premium clock-like instrument displays and chrome bezeled switches. 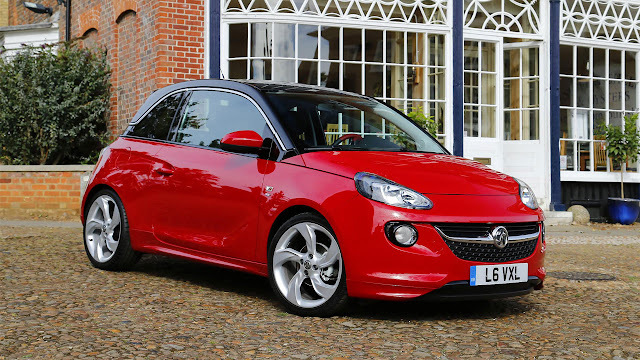 ADAM’s three trim levels – JAM (fashionable /colourful), GLAM (elegant/sophisticated) and SLAM (racy/sporty) are merely the starting point for a high degree of personalisation. Customers then have the choice of 12 uniquely named body colours, such as ‘I’ll be Black’, ‘Papa don’t Peach’, ‘Purple Fiction’, ‘James Blonde’, ‘Saturday White Fever’ and ‘Buzz Lightgreen’. Next comes ADAM’s roof: this can be given the same colour as the body or for a more contrasting look customers can choose from one of three finishes – glossy ‘I’ll be Black’, light cream ‘White my Fire’ or the dark and rich ‘Men in Brown’. A large glass sunroof can also be specified on ADAM JAM and ADAM SLAM and comes as standard on ADAM GLAM and is available in combination with all exterior colours. And for those wishing to go further still there is a choice of three different decal packages: ‘Splat’ for the ADAM JAM; ‘fly’ for the ADAM GLAM; and ‘Stripes’ for the ADAM SLAM. These can be applied to the mirrors, side and rear of the car. Even ADAM’S key is down to personal choice, and is coloured to match the body colour of the car. Moving to the wheels, in total ADAM is offered with the choice of 20 different wheel designs and colours in sizes ranging for 16”to 18”. Rims such as ‘Vintage’ and ‘Horns’ offer a classic look while, ‘Boomerang’, ‘Hurricane’, ‘Turbine’ and ‘Twister’ turn heads with more unconventional contemporary designs. In keeping with ADAM’s core values even after the customer has taken the car home some of the 18inch wheel designs can be changed again and again with the application of interchangeable coloured clips. Available in six different coloured sets the clips lock onto the five spokes of the rim. These can be the same colour of the body or can be mixed and matched for a more vibrant look, and if customers become bored, they can simply change them. Vauxhall is the first manufacturer to offer this unique design feature. ADAM’s cabin, if anything, has an even higher potential for personalisation than its exterior, so this section simply provides a broad overview of just some of the highlights. There is a choice of four base colours: Black, Cocoa, Purple and White. These combine with 15 different seat trims which are offered in a broad choice of materials and colours. Customers can then choose one of 18 different décor panels for the facia and doors surrounds. These panels can be ordered separately meaning that, like the wheel clips, ADAM’s interior can be constantly tailored to suit the changing taste of the owner, or subsequent owners. Among the 18 panels, 11 are painted to complement the exterior colour, eight are covered with a premium foil featuring decorative patterns of which two ‘Silver Fireflies’ and ‘Gold Fireflies’ are backlit by LED’s giving a soft glowing appearance – another industry first for Vauxhall. This exclusive design element is combined with the ambient lighting package which illuminates the door pockets, centre console and passenger footwell. As part of this package, seven different coloured lighting settings can be selected at the touch of a button. Owners have the freedom to pick just one of the eight colours which include red, two amber tones, yellow, green, blue, ice blue and white to light the cabin. If they can’t decide, they can switch the setting to continuously change through the spectrum of colours. Again this underscores ADAM’s virtually unlimited potential for personalisation. Inside the cabin roof can also be customised to suit every taste. Thanks to yet another industry first the roof can be tailored with the application of printed headliners, one of which is backlit by LED’s. Three motifs are available ‘Sky’ showing blue skies and white clouds, ‘fly’ giving the appearance of failing autumn leaves and ‘Go’ a chequered flag design. ‘Starlight’, the final roof headliner and by far the most spectacular, is illuminated by 64 LED lights giving the impression of a starry night sky. This stunning feature is something normally only seen on the world’s most expensive limousines and is an absolute first within the segment. fashion-led A-segment for the first time ADAM is not only a head turner it is also highly intelligent! ADAM’s biggest technology highlight is ‘IntelliLink’, an all-new infotainment system which connects the owners smartphone (Apple iOS and Android) with the car making ADAM the best connected car on the market. The IntelliLink infotainment system brings content from a smartphone onto the cars seven-inch, high resolution, full colour touch-screen display. Connectivity is provided via USB or Bluetooth for mass storage devices, including MP3 players, iPod, iPad, etc. The system, which is the first of its kind compatible with both Apple iOS and Andriod applications, enables personal playlists, photo galleries, phone books, other stored media and data to be accessed easily via the touch-screen in the car. Videos and personalised slide shows can also be viewed on the screen when ADAM is stationary. Thanks to the smartphone link owners will also be able to access internet-based approved apps via the IntelliLink touch screen. Apps such as Stitcher, the global podcast internet radio that lets users listen to programs live or after they have been broadcast, and BringGo a navigation app which offers maps for Western and Eastern Europe, will be available from launch with further apps coming later. Audio: The user can choose between AM/FM/DAB radio or his/her own personal playlists contained in the smartphone or storage device. IntelliLink uses the Gracenote music organisation for USB music devices which provides song information and album art. Gracenote is resident in the radio memory. Telephone: Hands-free phone calls can be made without dialling: the driver can select a name from the stored directory featuring up to 1,000 contacts visible on the touch-screen, touch the ‘call’ function and project the call through the vehicle’s speakers. Gallery: Personal photo galleries, slide shows, videos and other stored documents can also be accessed easily via USB connection (and Aux-in for videos for iOS Smartphones) and viewed when ADAM is stationary. Visuals naturally appear on the 7-inch touch-screen and sound comes from the car’s speakers. Apps: Apps stored in the smartphone enhance IntelliLink’s capabilities. At launch, the BringGo navigation App and Stitcher, an app allowing access to radio podcasts, will be available (further information below). Further apps will be available at a later stage. Car settings: The basic car settings are also accessible and can be modified via IntelliLink: language (23 languages are available), time, date, radio settings (volume, balance, fader, etc…) and connection settings can be controlled according to the driver’s individual tastes. In addition, information about climate control and Park Assist systems are also displayed on IntelliLink’s 7-inch screen. Selected apps that are compatible for smartphones using both Android and Apple iOS operating systems can be downloaded from the internet. For example, the BringGo navigation system will soon be available from the App Store and can be downloaded as a map version for Eastern and Western Europe. Once the app has been downloaded, the map data remains installed on the smartphone. This means that owners do not need a broadband connection to use BringGo and therefore do not need to pay any roaming fees while abroad. As BringGo always remains on the phone owners will also have the added benefit of continued guidance should they wish to complete journeys by foot or bike. A further benefit comes in the system’s ability to connect to internet search engines. For example, if an ADAM owner wanted to find a restaurant or hotel, they can just run a name search on the search engine and the results will then be automatically displayed on the BringGo map. Another useful App which will be offered for IntelliLink is Stitcher, a global podcast internet radio that lets users listen to programs live or after they have been broadcast. Once Stitcher is downloaded onto the smartphone, ADAM’s owner can access more than 10,000 podcasts on demand, radio shows and live stations around the world via the IntelliLink touch-screen. Available at the affordable price of just £275 the state of the art IntelliLink is option on all ADAMs with the standard infotainment kit containing CD / DAB Radio and Bluetooth connectivity. For those needing the ultimate sound experience an infinity sound system offering eight speakers including five 45 watt units and a 90 Watt subwoofer is also available. Another debut for ADAM is Advanced Park Assist II, a system which has never been seen before in a Vauxhall production car. Drivers engage the system with a button on the dashboard and it tells them when they reach a parking space large enough to accommodate the car. The system then automatically steers them into the parking space, with the driver only needing to control the brake, clutch and gears. APA II uses ultrasonic sensors to work its magic, and always comes in combination with Side Blind Spot Alert (SBSA). ADAM’s electrical power steering system also benefits from a dedicated CITY mode which at the flick of a switch increases power assistance at lower speeds. Offered as standard across the range this will be particularly useful in busy urban environments. Also standard is a comprehensive ESP plus system with functions such as Hill Start Assist and Cruise control with a speed limiter, allowing the driver to set a maximum speed. Optional features not usually found in this sector include a heated steering wheel and automatic dimming rear view mirror. Also Vauxhall’s clever Flex-Fix bike carrier is available on ADAM. The system which is integrated into the car’s bumper pulls out when needed to securely carry a bike weighing up to 30kg; an additional clip can also be purchased to allow a second bike of up to 20kg to be carried if required. ADAM is not only stylish, innovative and intelligent it is also safe and comfortable. Passengers in ADAM are protected by a very rigid passenger cell that is mainly fabricated from high-strength steel. They benefit from newly engineered front seats with excellent comfort and safety performance and are protected by a comprehensive airbag system comprising two front, two thorax/pelvis side and two head curtain airbags. With its chassis geared towards agile driving dynamics, the ADAM is not just at home on city streets but also on country roads. The compact wheelbase of 2,311mm is combined with an impressively wide tread of 1,472mm in the front and 1,464mm in the rear giving ADAM its solid stance on the road and excellent stability. The chassis – with MacPherson struts at the front and compound crank at the rear - was developed for crisp agility and optimal handling in the city without making any compromises in the country road driving dynamics. UK ADAM’s will also benefit from a UK-specific steering system which has been tuned specifically for the UK roads. At the same time, ADAM’s low center of gravity makes it grip the road, especially in tight curves. Dampers were tuned to the challenges of city driving. Wheel sizes range from 16” to 18”, and cars that are specified with 17” or 18“ rims come standard with a more tensed Sport chassis which delivers an even crisper steering feeling. ADAM is initially offered with three efficient petrol engines –1.2-litre 70PS, 1.4-litre 87PS and 1.4-litre 100PS. All are mated to a five-speed manual transmission and can be specified with an ecoFLEX technology pack that further enhances their efficiency. The 1.4-litre units provide maximum torque of 130Nm at 4,000 rpm; the 100PS version accelerates from 0- 60mph in just 11.5 seconds and has a top speed of 115mph. The ecoFLEX technology pack includes a Start/Stop system with a high-performance battery, heavy-duty starter, optimised generator and an ‘eco’ switch allowing its activation or de-activation; in addition, it also features an Eco Drive Assistant that monitors energy consumption and indicates when to shift up. The Ecoflex’s 16” wheels and special low-rolling resistance tyres complete the package and help the ADAM achieve exceptional frugality in the combined cycle. The ADAM 1.2 ecoFLEX has fuel consumption of 56.5mpg with CO2 emissions as low as 118 g/km while both 1.4 ecoFLEX models consume 55.4mpg and have emissions of just 119 g/km. Vauxhall is also developing a new generation small petrol engine that will premiere in the ADAM later in its life. This all-aluminum unit will feature direct injection, turbocharging and Start/Stop technologies for further enhanced efficiency and performance. It will be combined with an all-new generation six-speed manual transmission. ADAM not only provides more individuality than its competitors, with a high level of standard equipment and affordable options, it also offers more car for the money. Take ADAM JAM – for just £11,255 it gets, 16inch Horns alloy wheels, leather wrapped steering wheel, air conditioning, CD player with USB facility and aux-in socket, DMB digital radio, bluetooth connectivity, trip computer and cruise control all as standard. Moving up to GLAM from just £12,650 it gets all of the equipment as seen on the JAM plus climate control, 16inch vintage alloys, a fixed glazed sunroof and LED daytime running lights and tail lamps. Moving up again SLAM adds the 17inch hurricane wheels, a two tone roof pack, Morracana seats and sports suspension all for just £13,150. The extensive option list also proves that customisation no longer has to cost the earth. Affordable options such as printed headliners (£100), the interchangeable décor panels (£70), the state of the art-IntelliLink system (£275) and the ambient lighting package (£125) to mention just a few. Remote control central door locking. Leather wrapped steering wheel with deco elements, cruise control & infotainment control. Up level tuner / CD DAB radio with USB, Aux in Bluetooth & 6+1 speakers. Front & rear LED lights. Chrome pack (DLO. door handle & door sills). Chrome DLO & door sills. Two tone roof & darkened rear glass.